I’ve seen many questions online on how to use a script to mark the two checkboxes in this “Advanced TCP/IP Settings” window. $networkConfig = Get-WmiObject Win32_NetworkAdapterConfiguration -filter "ipenabled = 'true'"
The first line gets the adapters with a valid IP address. The second line sets the “DNS suffix for this connection” field. The third line enables each of the two checkboxes – if you change one of the $true values to $false, it will uncheck the corresponding checkbox. Finally, the last line simply updates the new settings in DNS without the need to restart the machine or anything like that. This script can be deployed by SCCM as a package or an application, for which you can use this application detection method. This entry was posted in PowerShell on February 14, 2017 by Boris Kagan. Works perfect, thanks so much! Was looking for days to find a way to do this. Most other tutorials just show how to set the “Append these DNS suffixes” list. Is it possible to apply this command to all network adapters or individually named network adapters rather than the one currently pulling ip? This is great working little script, no issues when implemented correctly. However, I have massive a deployment projects, which requires each Network Adapter to have the same settings applied, regardless if the adapter is connected/live with an IP-Address. How would I go about having the other adapters configured exactly the same, even though they’re “Not Connected/No Connection”? Nice script. 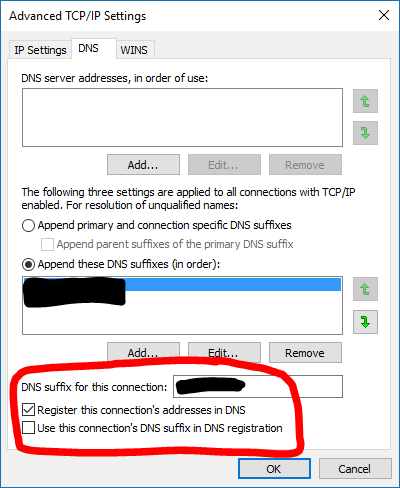 What is the command to set “append primary and connection specific DNS suffixes” radio button and the check box “append parent suffixes of the primary DNS suffix.”? Please consider disabling your adblocker to help support this website. Blocking advertisements hurts website creators. Websites cost money to run, and the website content is provided to you at no charge. By allowing unobtrusive and minimal advertising, you are helping to pay the bill to keep this website running. If you could disable your adblocker on this website, I would greatly appreciate it. All content and scripts are provided "AS-IS". No warranties are expressed nor implied. Use at your own risk. Every computing environment is different, so your results may vary. Make sure to test everything in a safe test environment prior to deployment.